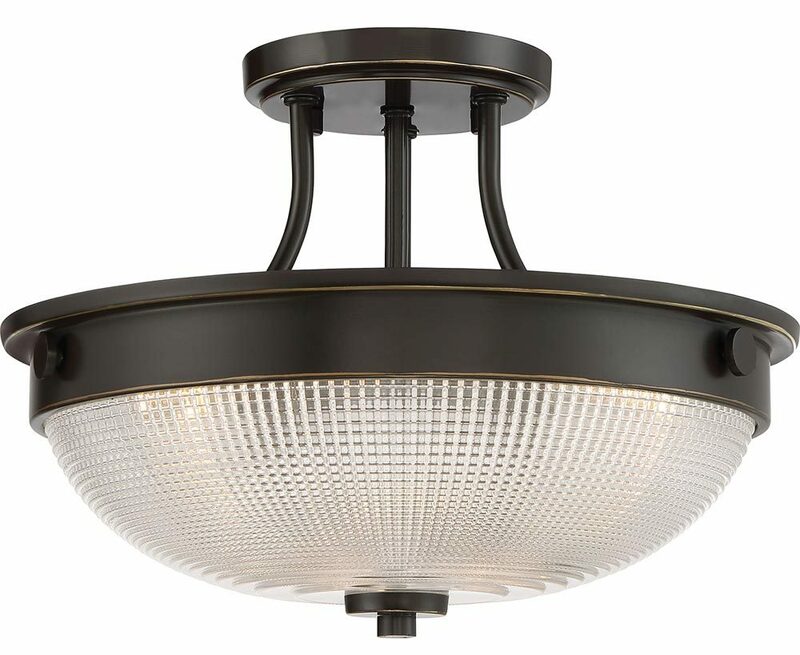 This Quoizel Mantle 2 light semi flush ceiling light in Palladian bronze finish features Art Deco style. Circular ceiling mount, three curving arms and circular frame, with wonderful prismatic glass dome shade and lower Palladian bronze retaining finial. The shade is held in place by thumb screws and a central drop rod holds the two lamp bulbs, which shine through the prismatic glass creating a wonderful diffused glow. This medium sized semi flush has a beautiful prismatic glass dome shade set into a classic ceiling fixture. The understated Art Deco style provides a soft yet stylish look for any room and the feature shade diffuses the light perfectly to illuminating the room with a soothing glow. A simple yet thoroughly stylish fitting for almost any themed room. Choosing a light to complement your Art Deco themed room couldn’t be easier than this semi-flush ceiling fitting. Perfect lighting for rooms with a low ceiling. Also available finished in Imperial silver and weathered brass, please see below. A superb quality ceiling light supplied by Elstead Lighting and designed by Quoizel, founded in 1930 in New York. They have quickly built a reputation for their diverse, unique and fresh designs such as the Mantle 2 light semi flush ceiling light in Palladian bronze finish you see here.